1) Appearance - The gardens surrounding this restaurant are majestic, and the lazy river floating by adds to the charm. The restaurant itself is cozy, charming, upscale, with a rustic touch. 2) Service - Great; our server was very professional and knowledgeable and came with great recommendations. 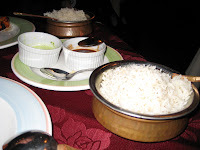 3) Portions - Great, very satisfying. 4) Taste - Great, although not exceptional. 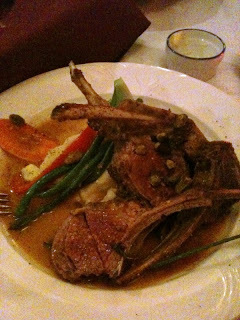 I ordered the Rack of Ontario Lamb, garnished with Pistachio nuts, and a merlot and dijon mustard sauce, with a side of mashed potatoes and steamed veggies. It was very nice, very juicy, although not too flavourful. I needed to add a lot of salt and pepper on the meat. But it was definately very nice. 5) Price - Not too bad. 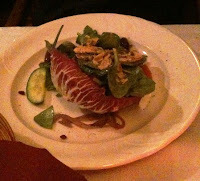 Although my dish was one of the more expensive ones on the menu, at around $30.00, our bill was under $100. Overall, a very nice restaurant for a cozy, romantic dinner. It was a nice change from driving into the city. Instead we drove north of Mississauga through a very scenic route! 1) Appearance - Very cozy, like being in someone's dining room. 2) Service - Good service, very relaxed and comfortable. Our servier had great hair! 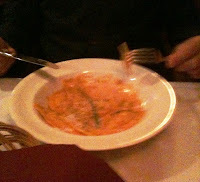 4) Taste - The pasta was very nice. I had the "Crespelle al Forno"- Baked home-made crepes stuffed with spinach and ricotta cheese, topped with a rose sauce. It was perfect. The salad was interesting. 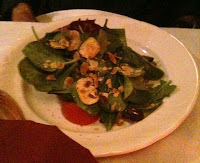 I had a spinach salad which came stuffed into a large cabbage leaf, and topped with mushrooms and nuts. 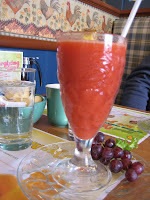 5) Price - Very good for great food, and a very comfortable and relaxed atmosphere. Overall, an excellent dining experience! 1) Appearance - cutest, brightest, cheeriest little breakfast place on earth! 2) Service - cheery, bright, friendly. 4) Taste - amazing! 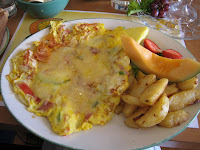 I had an Omlette with everything on it, including cheese! It also comes with raosted potatoes, which are bursting with flavour, and of course, fruit (grapes, cantelope, pineapple, and strawberries, on the side). I ordered a fruit cocktail to drink, it was great! 3) Portions - good portions, but there was tons of fruit! A bit too much fruit for me. 4) Taste - Best Eggs Benedict outside of my house. 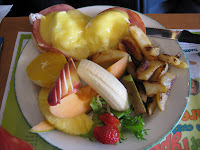 5) Price - We paid $40.00, which is a bit expensive for breakfast, and a bit higher in price than other breakfast restaurants, but then again, the food was better. A M A L says DEVOUR THIS FOOD! 1) Appearance - ugly. But I once did a live reading there so I love it anyway. It's also home to many legendary rock n' rollers such as Daylight for Deadeyes, Ron Sexmith, etc. 2) Service - What can one say?....I guess the service is fine. 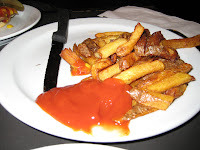 4) Taste - shared a hamburger and fries with Chris, and had a magnificent beer. It was all magnificent. 5) Price - great. Average for bar food. C H R I S says DEVOUR THIS FOOD! 2) Service - bland. The girls were fine, but it's questionable as to whether or not they have emotions. Not that you'd want emotional servers, but some sign of life would be cool. 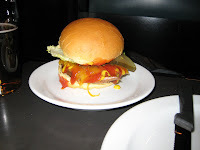 3) Portions - I had to share a burger and fries... :( I pretended to be full. 4) Taste - it was perfect. It was exactly what we were looking for as a slight break from our Queen Street shopping. 1) Appearance - dark, warm, nice chairs and furniture, but too open. You walk in and all the chairs and tables are visible, so when sitting, you feel a little exposed. Ceilings are also too high - they would benefit from adding bulkheads to lower the ceiling by atleast 10 feet. It must be at least a 20' high ceiling. They would also benefit by accessorising a bit more with artwork...The furniture is nice but artowrk on the wall is very shabby and disproportionate to the overall scale of the restaurant. However, I would say that my favorite part of the dining experience was the cutlery and serving dishes - very authentic and unique! 2) Service - Polite, helpful, but very shy. 4) Taste - FANTASTIC! I was very pleasantly surprised. We ordered the Pineapple Chaat as a starter to share, and it was phenomenal. It almost tasted like a Mexican Salsa - it had pineapple, potatoes, tomatoes, cilantro, spices, it was a perfect blend of flavours. For my main dish I ordered butter chicken. Again, phenomenal. 1) Appearance - Reminded me of someone's finished basement, minus the pool table and the furnace. 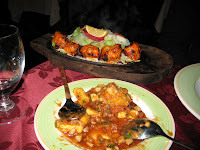 4) Taste - I need to do my research on Indian Cuisine, but our Pineapple Chaat starter was excellent, I ordered Chicken Tikka with a side of rice, which was also excellent -It reminded me of Middle-Eastern Kebabs, it had a nice lemon flavour to it. And mixed in with the lettuce and veggies that come with it, it was very fresh. 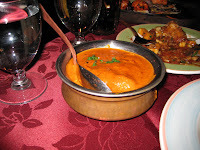 I also had some of Amal's butter chicken, which had a very smooth taste! 5) Price - Great price for great food! 1) Appearance - cozy, dark, rustic, but a little shabby, which is surprising since they advertise as "fine dining". The dining part was fine, but the appearance wasn't all that. They had weird pendant lights hanging randomly, which made them look like wierd UFOs or something. 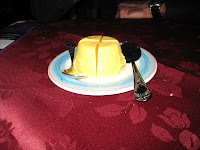 3) Portions - fabulous! Chris and I shared just two appetizer dishes (the Bruschetta and the Tapas Platter), with their house Red Wine, and we were both stuffed after! 5) Price - Reasonable. See their menu with pricing online. 5) Price - OK. I would like to go back and try a main course next time. 1) Appearance - long, narrow, white. Cool looking. 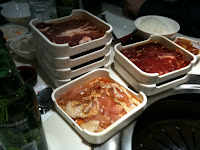 What caught our eye was the individual grills at each table; you order your food, and grill it to your own perfection! 3) Portions - great great deal - they have an all-you-can-eat option! 4) Taste - good, but a little bit salty. The all-you-can-eat option included chicken, fish, salmon, beef, beef ribs, pork sausage, pork slices, ox's tongue, some kind of liver. You also get a few veggie side plates. 5) Price - great! $13.00 per person! 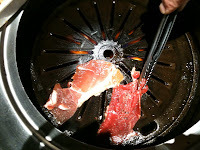 1) Appearance - kinda cool, different, everyone gets their own little grill to grill your own food. It's pretty exciting at first, but then becomes kind of annoying. 4) Taste - I usually eat so much when it's all you can eat that I can't really taste the food anymore...it tasted really good when we first started grilling things! Chicken, beef, fish...YUM! 5) Price - pretty reasonable for all you can eat, and a pretty interesting dining experience!! !